The Tango snack vending machine is perfect for popular sites, offering a large choice of selections. 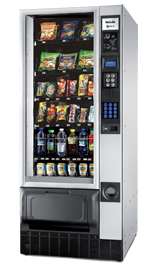 Melodia Snack vending machines provide an impressive vending solution, offering a selection of many snacks and drinks. The UKV Festival food vending machine is the perfect solution for vending fresh food and snacks. Snack vending machines are extremely useful in any location but are particularly appreciated in the work place. Whether you are a small enterprise or a large corporate entity, snack vending machines are always popular and can even improve business. Rather than having to leave the work place for lunch or a snack having the convenience of a snack vending machine means that employees can satisfy their hunger pangs whilst remaining on site. This encourages employees to continue working without downing tools even then they are on breaks creating a more fluid work flow. A vending machine is also ideal for resolving those mid-afternoon sugar dips and provides the perfect excuse for employees to take a few minutes out of their work. Having a short break is proven to be extremely effective in creating a workforce which is refreshed and invigorated and unlike the catering staff which operate canteens or other on-site catering services snack vending machines are effectively self-managing. They don’t have time off sick, demand a salary, annual leave or require a pension! For those who still have doubts about the benefits of having a snack vending machine in the workplace, consider the number of informal discussions which take place when selecting a favourite chocolate bar or sandwich. Apart from discussing the latest office gossip or sports results, snack machines also provide a great location for informal interdepartmental discussions and brainstorming. Quite apart from the invaluable team bonding which tends to take place around food, discussing business in a relaxed environment is also extremely conducive to idea generation. For those with space restrictions our UKV Jazz vending machine is a great solution, offering a large selection of food and drink items within a compact and stylish design. For those with more ample space the UKV Jazz 27 machine can offer an impressive 344 items including 18 confectionary items and 9 crisp selections. Once the UKV snack machine is installed it requires minimum input. The snack machines can be operated with either a pre-paid card or cash which means that there are no issues with non-payment or unexpected costs. The benefits of a snack vending machine are clear. Not only will you have a happy workforce who can maintain their energy levels all day long without the need to remember to bring in provisions or to wash up dirty crockery but offering this facility to your staff will also feel make them feel valued and cared for. 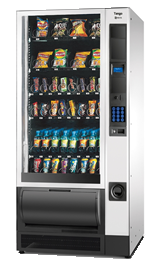 All our snack vending machines are available on either a lease or purchase basis and come with a wide variety of options in terms of snacks and drinks including chocolate, food, confectionary, nuts, snacks and crisps. Being able to lease the snack machines gives you the opportunity to try out the machines without any significant financial commitment. The benefits of a snack vending machine are clear: a happy workforce who can maintain their energy levels all day long without the need for provisions or washing up dirty crockery. Isn’t it time you ordered your vending machine?